I start with a quote from the River Restoration website of the CRC for Catchment Hydrology 1999 - 2006. It's such a positive move to look at how the aquatic ecosystem is affected by environmental damage and what changes occur after river restoration. But what is missing from this report is the human element - whether damage to the ecosystem is related to human impact, whether the communty was involved in restoring the river, and what has been the outcome of river restoration in terms of social and spiritual capital, community engagement in the riverspace, and the community health and wellbeing effects of this engagement. For instance, a study on the restoration on the Skerne River in rural Britain has shown that the outcome for the human community has been greater public engagement and concern. Not only is there more human-river connection, water quality has improved and wildlife, which was once absent, 'now abounds with swans, fish, dragonfly and the rare water vole all recorded and with waders now seen feeding in the shallow backwaters and pools'. Would such a positive effect occur in the SE Queensland region if there was more attention to river quality and river care, especially in the rapidly expanding urban areas? Here, however, increasing development in housing density and urban spread (read sprawl) goes hand in hand with ecological disturbance. And more. It takes a willingness and an awareness of the impact of environmental damage to implement sustainable urban development, to replace the damaged shrubs and trees, to create food and housing for bats, birds and possums and provide health and wellbeing outcomes for the human community as well. So what are the issue at stake here? 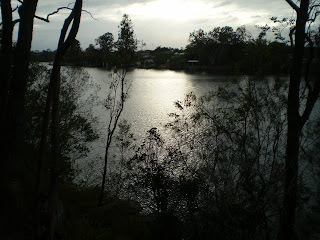 A report on river systems in South East Queensland has incorporated the human element in river management strategies. The South East Queensland Healthy Waterways Strategy 2007-2012 Phase 4 Consultation Draft, Logan-Albert Catchments Action Plan (2007) lists a number of barriers to effective rivercare and water management. The barriers are logistical, economic, educational and environmental (outlined below). But one barrier is missing and that is urgency. In its recommendation about the need for Protection and Conservation , the report states: 'By 2026 all SEQ waterways and wetlands, vegetated areas that contribute to waterways healthy, and drinking water catchments are protected and conserved.' (p.93). 2026? Why not 2007? The implication for what's going on in riverways now, and for the next 20 years, is worrying. What are the other barriers? The report declares that major problems include: limited opportuntiies to raise awareness, build capacity, develop skilled project management personnel, as well as 'no clearly identified lead agency to coordinate strategic management of catchment issues'. Why ever not? Accompanying this lack of overriding coordination of river catchments, the report documents a lack of funding 'for the catchment management community to implement the large-scale projects ... needed to reduce impacts on downstream waterways'. Leadership. Funding. Skilled personnel. What else is at issue? The report presents a litany of concerns: 'a loss of aquatic habitat, riparian vegetation and declining water quality [which] can result in further problems such as the proliferation of exotic pest species [such as carp], as well as a 'lack of understanding of Aboriginal culture' which may lead to a 'loss of valuable cultural heritage sites and local knowledge of environmental management practices'. Could there be any more concerns raised? The list of problems was beginning to seem insurmoutable. Just one more. A lack of education and awareness about local ecology and scientific research was also seen as hampering effective management. This was noted to be related to the lack of central coordination and leadership. This lack of awareness was deemed to affect the potential for the community to volunteer in the river and catchment care project. The problem was cited as being 'extensive'. Now when I witness the destruction along the river corridor and the unthinking destruction of habitat, I know there are people out there trying to create a different more sustainable outcome but they are doing it without the necessary support. It seems that the river and river systems sit in the hearts of the scientists, natural resource managers and volunteers who, like me, may not want to wait for another 20 years for local river ecologies to be protected and conserved.